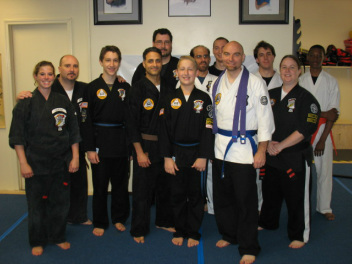 Our adult training program focuses on teaching the principles and concepts of Kenpo. Ed Parker’s American Kenpo has been described as "the science of street fighting" and a study of motion. Not only do you learn how to develop your physical abilities, but your mental acuity as well. Our instructors stress Kenpo basics and drills to harmonize the mind with the body. In our adult program, we strive to give each student the best understanding of Kenpo possible. The instructors expect the students to ask questions, and embrace the safe, learning environment they are in. Private lessons are available for all belt levels. Speak to a black belt instructor for more information. Tuesday & Thursday have open mat time after class from 8:00-8:30pm.